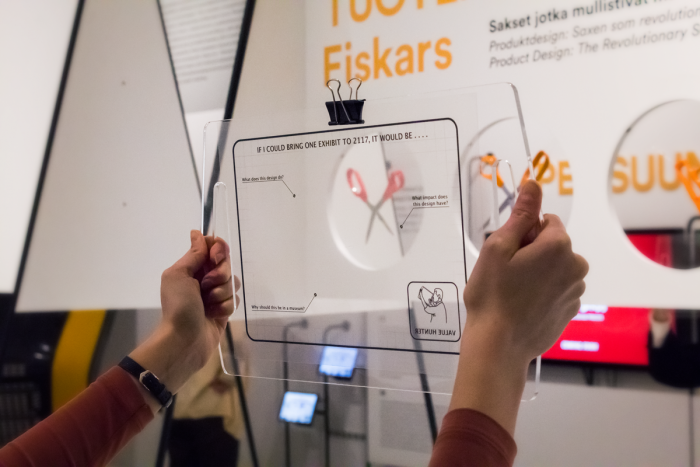 This interesting personal project by Pia Laulainen was done in collaboration with the Design Museum and aims at broadening interaction between museum visitors and the museum. Value Hunters is a participatory pilot workshop concept that was designed for the “Utopia Now” collection exhibition at the Design Museum. 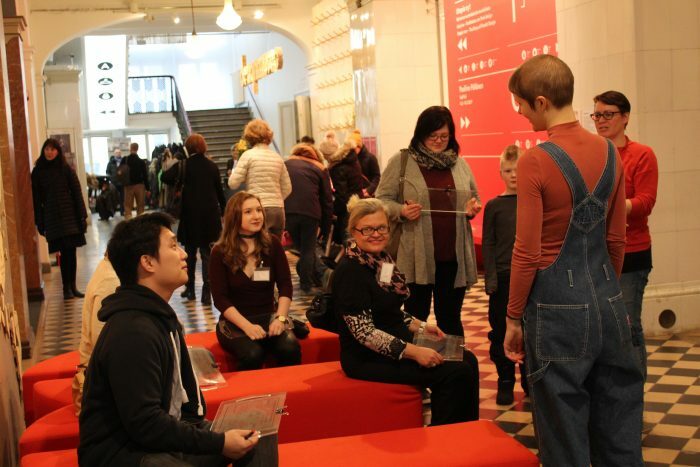 We, a team of three design students from Aalto University (Aliisa Talja, Will van Twuijer and me) developed, designed and executed four pilot workshops in the means of broadening the intersection and interaction between museum visitors and museum. The project started almost by accident in September 2016. A brief meeting at the school corridor with Tuuli Mattelmäki, professor at Aalto University, School of Arts, Design, and Architecture, led to a five months project. Mattelmäki invited me to participate in a meeting she was having with the Design Museum personnel on September 29. In the meeting, Leena Svinhufvud (the Educational Curator) and Katarina Siltavuori (the Exhibition Curator) introduced Mattelmäki and me to the preliminary plans for the new “Utopia Now” collection exhibition, which was planned to have its opening ceremony in four months, in the beginning of January 2017. The “Utopia Now” exhibition would be a fresh reformation of the traditional way of showcasing the museum’s own collections by including process descriptions and documentation side by side design artifacts. An interesting design phenomenon of our present time, Service Design, was also entailed to the exhibition – as I understood from the conversation – for the first time in museum’s history. Our role, Mattelmäki as a professor, an educator and an expert of Service Design, and me, a present student, was to share our opinions and ideas on how Service Design (SD) could be exhibited to the audience, and how the SD processes could be explained through a participatory way. To my surprise, I left our one-hour meeting with a “Utopia Now” related brief in my hands. 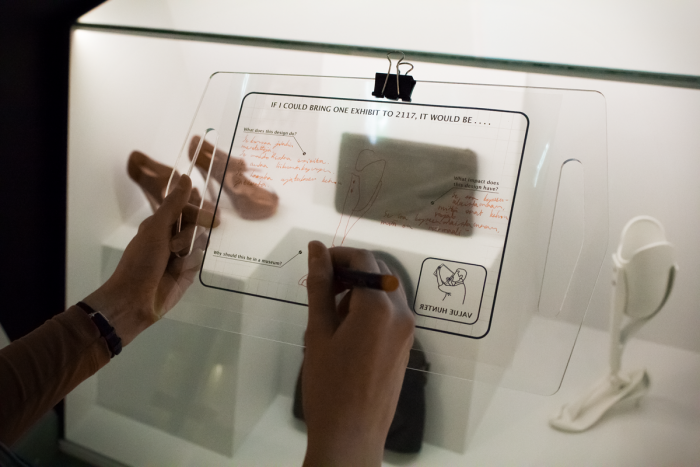 I was given the task to design a participatory element for the exhibition that would offer visitors a self-exploratory way of understanding what Service Design is about. It didn’t take much time to realize that I needed help with my task. I asked, with the approval of Design Museum, two design student colleagues to help with the work. With the team of three (Aliisa, Will and me) we started to collect data and gain understanding of the museum context, the service design field, and the participatory involvement methods. Through readings and hours of talking – within our team and with Design Museum people – questions led to questions. As we immersed ourselves deeper and in more detail into the “Utopia Now” exhibition description and goals, we perceived the vision that rather than involving visitors to the “Service Design Thinking”, we should try to generate and support open conversation about the overall means behind design – the values that are engaged in every design and also in museum choices made by exhibition curators. We should try to design a participatory workshop that would encourage visitors to thinking and self-expression instead of ready, guided and positioned process thinking. Our hesitation to introduce our new framing of the brief proved to be redundant. The museum personnel agreed with our reasoning, and gave us full trust and free hands, within budget and resources of course. With this authorization, we started to ideate and develop a workshop concept that would involve and empower visitors to comment and communicate with design and the Design Museum. The final outcome, the Value Hunters (Arvojen Etsijät) pilot workshop, was executed four times at Design Museum in February 2017: two times at the “Utopia Now” exhibition opening day and twice during the Design Museum open doors day. The approximately one-hour Value Hunters workshop had the following concept: I and Aliisa were “future agents” from the year 2117 and we had come to Design Museum with an aim to understand what was meaningful in the year 2017 and what would be valuable to preserve for the future. Participants were equipped with “Value Scanners” (transparent drawing boards with transparent sheets), markers and Value Hunter nametags. The workshop started with the scenario and task narration which guided Value Hunters to the “Utopia Now” exhibition. Each Value Hunter performed individual “value hunting” and argued and documented own findings with the Value Scanner. After the hunt, everyone gathered in a studio room to show their own choices and share own thoughts. 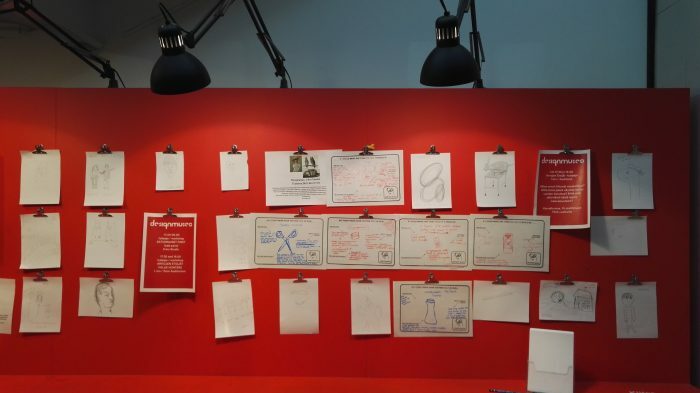 To create a broader network of opinions and ideas, and to communicate with the museum itself, all sheets were collected and hung up to the entrance hall after the workshop. 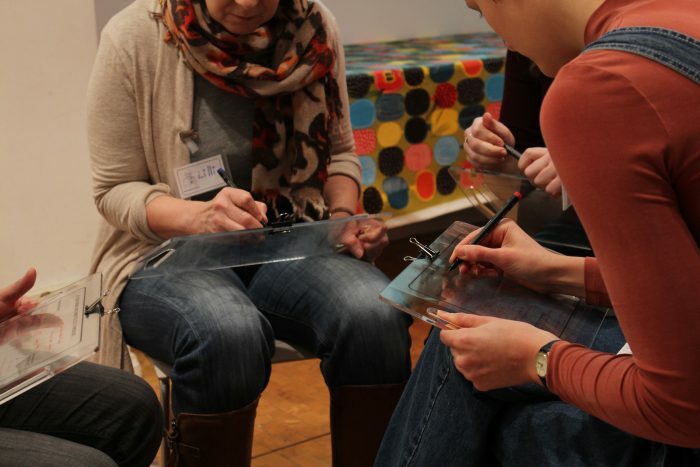 Developing a participatory workshop concept for a museum context was highly motivating, challenging, and satisfying. Warm thanks to Tuuli Mattelmäki for enabling my participation to the starting point meeting, huge hug to Aliisa and Will for their demanding intelligence and fun companionship, and grateful respect and thanks to Hanna Kapanen, Leena Svinhufvud, Katarina Siltavuori, and Sanna Turunen for their equal, open-minded, enthusiastic and respectful attitude and collaboration with our team.